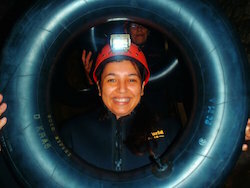 Waitomo black water rafting can be scary but it's a lot of fun too. 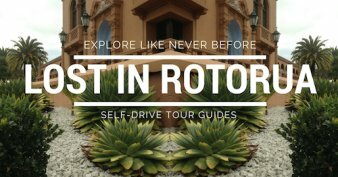 Join my daughter Elise, her boyfriend Scott and myself as we take a tiki tour (that's NZ slang for 'going on a walkabout') to try out this 'Tube It Waitomo." 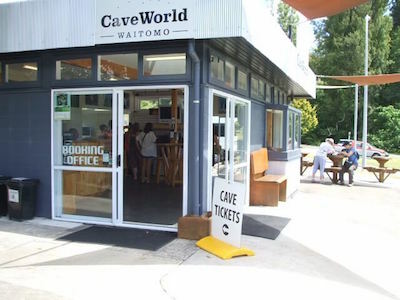 CaveWorld is a family owned and operated business based in Waitomo, a tiny little township that boasts only 300 odd people - on a good day. 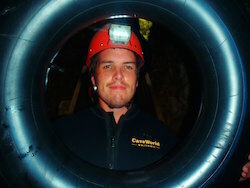 In addition to Waitomo black water rafting, CaveWorld also provides abseiling experiences and dry cave walks. Situated next door to the iSite information center, you can't miss it. The staff at reception were very welcoming and friendly setting the tone nicely for our tour. We were shown where the van would be loading up and told what to expect both before and after the tour. 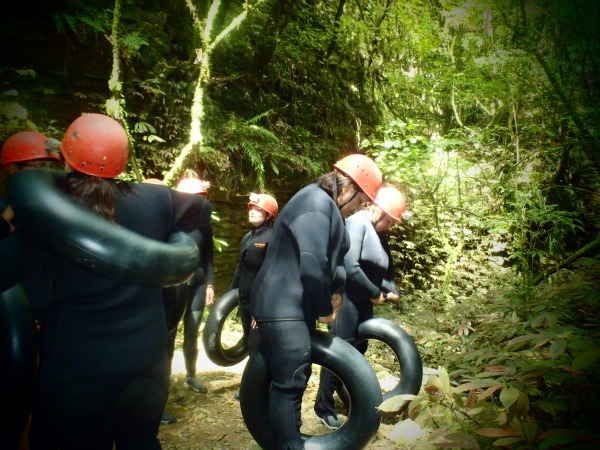 I assumed that Waitomo black water rafting was on a big raft, like the white water rafts but no, it's actually an inflated Tyre inner tube that sits around ones waist. This was somewhat confusing until I looked into it properly. Rodney, our guide, drove us the short distance to where we suited up in thick, thick wetsuits. Oh boy, what a mission that was trying to get into the blasted things. Imagine putting on stockings that are super tight, ultra thick, and stick to your skin every inch of the way up. Wriggle, wriggle, stretch, wriggle, hoist, hoist, wriggle - get the idea? 'Some mothers do have 'em though. First I put my suit on back to front, then I ended up with it inside-out… this was after Rodney's explicit instructions. Some people huh? Rodney and I decided that inside-out was good enough. Next came booties which were a lot easier, then helmet's with lights and we were primed and ready. It was back in the van for a drive of less than five minutes to get to farmland. 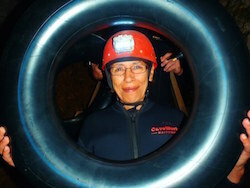 On getting out, we walked up and over an incline to get to the Waitomo black water rafting cave. To be dressed in a wetsuit traipsing through long grass amongst cow poo and thistles - no cows thank goodness - felt utterly weird. 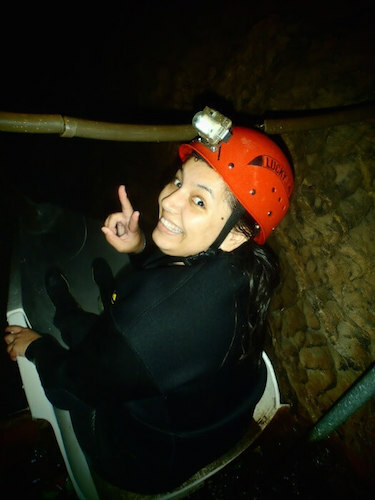 By the time we reached the cave, the exertion combined with the constriction of the wetsuit had everyone breathless and hot. It's a good time to be fit. Picking up the tyre tubes came next as we left the farmland and headed into lush, vibrant native bush. 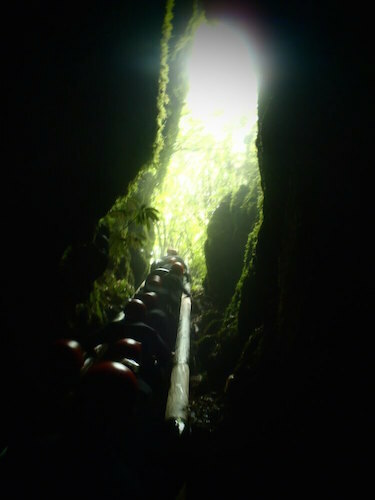 A short track followed by stairs began our descent into the cave. Rodney was joined by Ku, another guide. 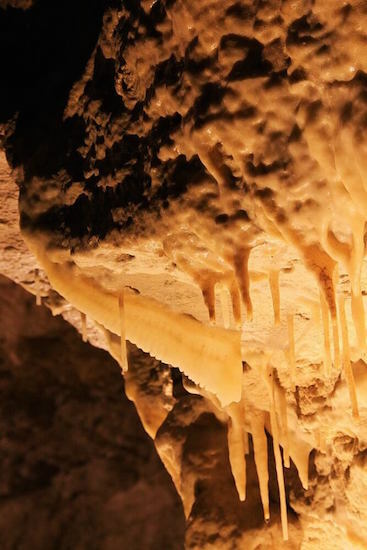 Ku gave us some history on the area and the cave and what we could expect to see as we went along, plus what to watch out for e.g. 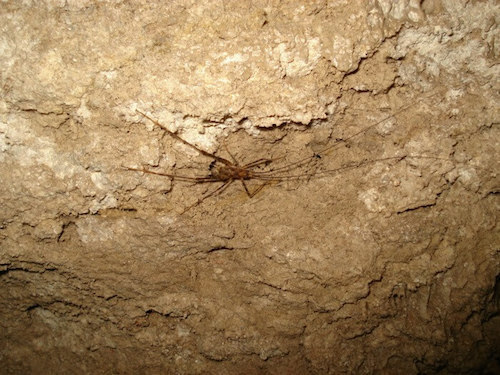 cave wetas (like big spiders). Yuk. He also mentioned that glow worms in New Zealand and Australia are unique to these countries. 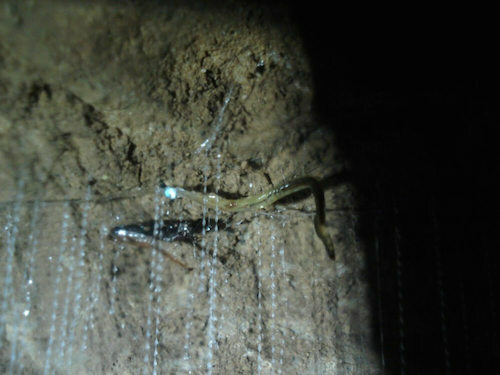 Within meters of entering the cave, tiny twinkling blue-green lights announce their presence. 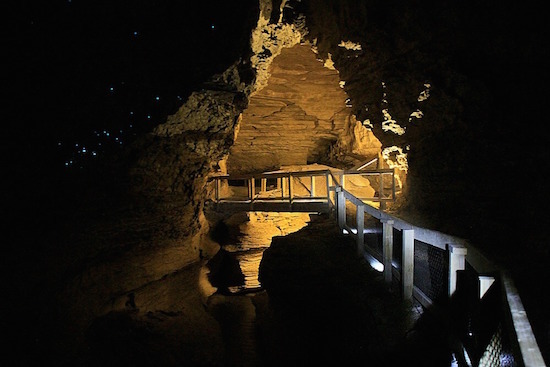 Once daylight was left behind we turned off our lamps and the glow worms put on a show. Rodney told us how the light is actually coming from their backsides, of all places. Somehow he made a loud booming sound that had us jumping out of our skins and the glowworms lit up even more with the sheer fright of it. Because the roof was low at this point, it was easy to see the glow worms (not pretty) and the sticky, fine gossamer threads (very pretty) they send down to capture unsuspecting prey. 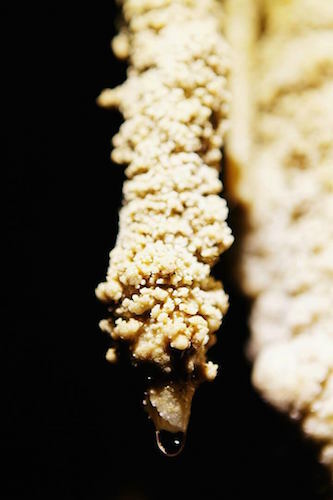 As we walked, small and medium-large stalactites and stalagmites dripped with the odd drop landing on my face as I looked up, this is supposed to be good luck. 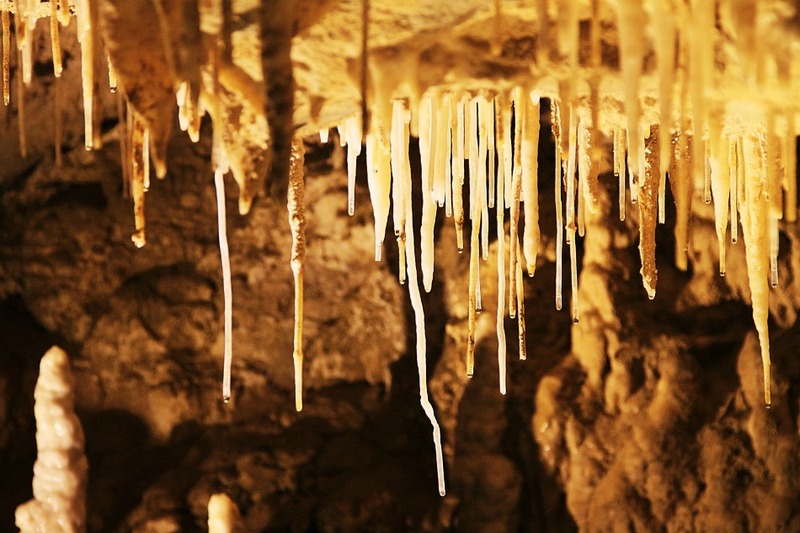 In addition to being fragile, if touched, the oils from our skin tarnish the formations. 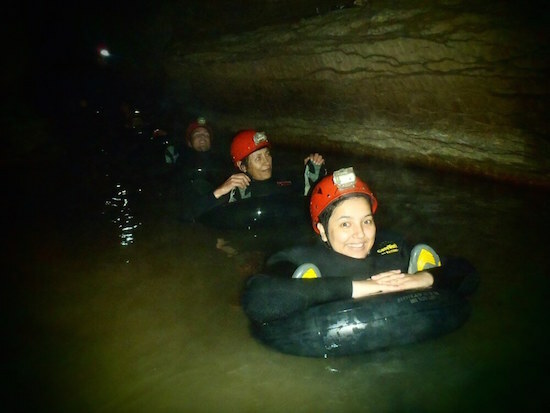 Once we hit water, with the tubes now up around our waists, Rodney and Ku had everyone turn the headlights off and we had to feel our way. It was surreal. In the pitch black (apart from the glowworm lighting) we had to use one hand to feel along the wall and the other was on the shoulder of the person in front. The icy water got deeper by the step until we were bobbing along. We bumped over and around outcroppings underneath the water and then? The bottom dropped away completely. That was it. Time to be officially scared out of your wits. You didn't want to touch the walls in case of Wetas, but had to anyway, and the thought of prehistoric creatures with sharp teeth lurking underneath your feet didn't bear dwelling on. A good example of an over-active imagination at work. Arriving at the foot of a small ladder, we had to climb up, turn backwards, hold the tube under our backsides and jump - that's what you call a leap of faith. It was cool fun though. Talking to the others in the group, most of us felt the bottom with our backsides on landing in the water. It didn't hurt though, the padding on the wetsuits is thick. A train was formed then by hooking our feet onto the tube in front. We meandered along using our hands to help propel the train. 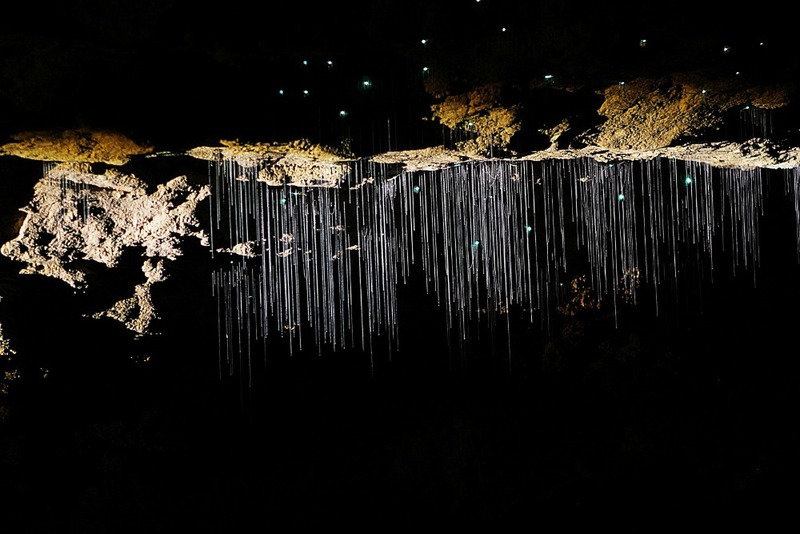 Thousands of glowworms accompanied us so it's very like having a starry night sky above. Heavenly. 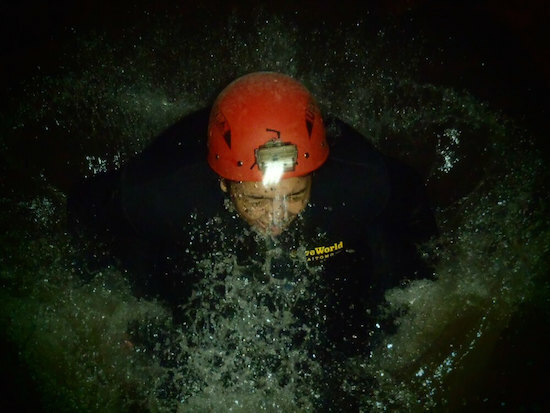 The only problem I had was wanting to lie my head back to relax and watch the glow worms but the thought of that cold water shooting down the neck of my wetsuit put me off. Next up was the hydro slide. I don't know how long it is because it disappeared around a corner but, it's a super fast slide and over in an instant. You know on a surface level that you'll be landing in water but it's still a huge shock when you do. Rocketing into it at 100kph (felt like it), water rushes up the nose, over your head and down the neck of your wetsuit. Brrr, freezing. Just like kids though, it's one of those things you want to do over and over again because it's such a lot of fun. Not to be, we had to push on. Now there were ropes attached to the walls so that we could pull ourselves along until we got back onto dry land. Following the path (very easy, you can't get lost) while Ku and Rodney oversaw the rest of the team hydrosliding, we made our way around twists and turns and finally saw faint smudges of daylight filtering into the cave. We'd made it! What a beautiful, beautiful sight it is to look up at the greenery after being in the dark so long. The light streaming down was luminescent and the colors were so rich and, once again, majorly vibrant. 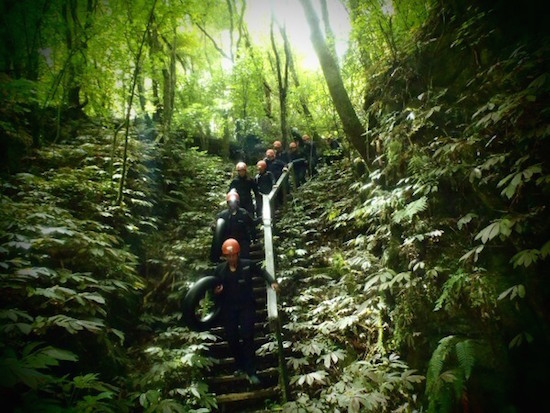 There are lots of steps to climb and, weighed down with soaking wetsuits and booties filled with water, it's not easy. Strange, you don't need fitness for being in the cave, it's to make getting there and getting out easier. When we got to the top the van was waiting right there. Bonus! We thought we'd have to trek back across the farmland. 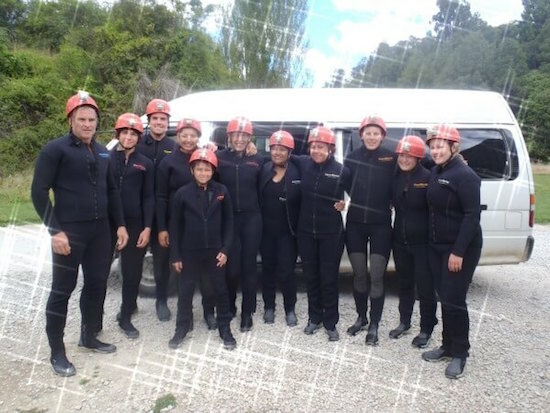 After hot showers it was back to CaveWorld headquarters for a hot drink and to check out all the pics of our Waitomo black water rafting experience. Before we knew it, it was time to head home. Overall, we thoroughly enjoyed our trip. 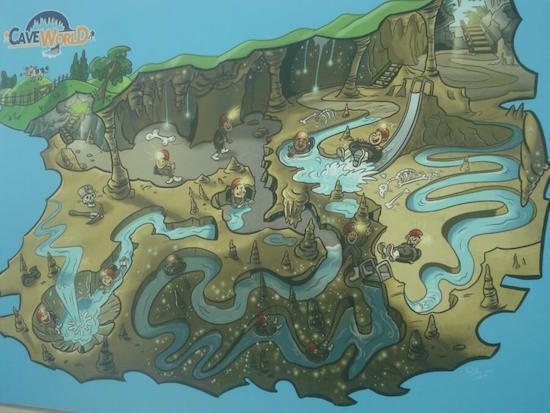 We missed out on the option to see a waterfall you could crawl to. I meant to ask the guides why and forgot all about it. Surprises? I didn't expect the water to be brown and the stream not very wide. I also had it in mind that we would see lovely high waterfalls cascading. The reality? The two small waterfalls were approached from the top and obscured by platforms for the slide and jump (they weren't too high by the way, 3m at the most). That was disappointing. 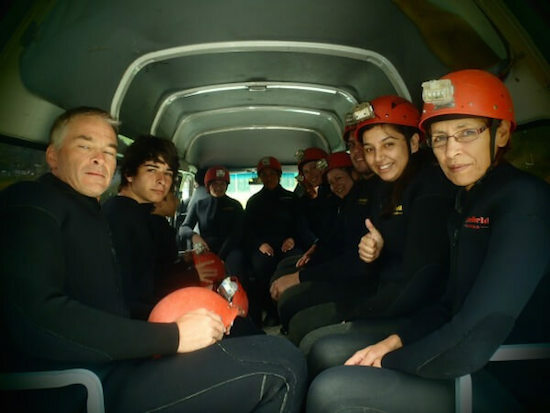 Chilling out at CaveWorld's headquarters after our Waitomo black water rafting tour - Elise and Scott are on the right. It doesn't take anything away from this experience though. We learned a lot, had fun, just about got the the pants scared off us, and marvelled at what mother nature is capable of creating. 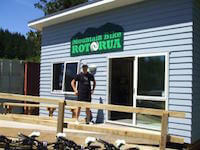 If you don't have a vehicle you may be like to view Waitomo tour options. 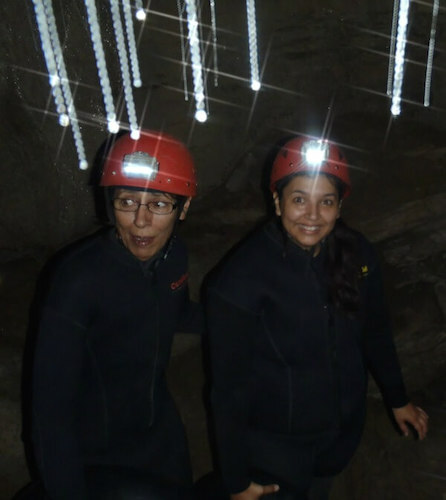 Some people stay over and visit the various caves because each one is unique. Got your own transport? Good. Armed with my google map directions, we set off at about 10am for our Tube It Waitomo tour at 12.30pm, this was travelling from Rotorua to Waitomo. What another mission this was! Luckily I had printed out the directions or I would have had to stop to ask the way numerous times. There's a fair amount of turns and changes of direction through rolling countryside. Roads are winding with some narrow and others wider, all the time we had to keep alert for the next signpost. With one toilet stop on the way, we got to Waitomo with about 10min to spare. 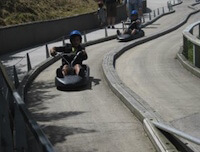 Travelling to Waitomo from Auckland or Taupo looked less complicated. Enter your start/stop points in the google map if you're heading in from either of those ways. 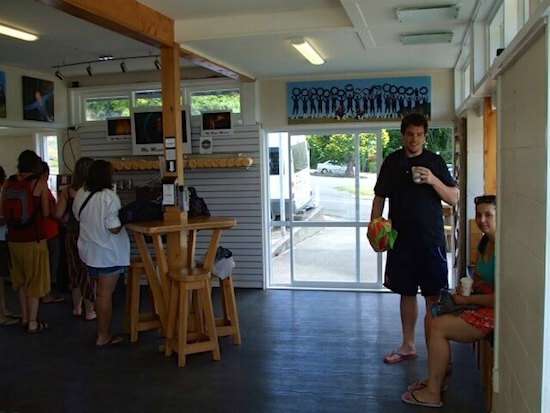 There are quite a few food places, both cafes and restarants within the immediate vicinity of Waitomo as well as outside of it. If you spat, you'd hit them, that's how close they are. We didn't stay though because I wanted to stop at the Big Apple Cafe further up the road to check out their organic orchard next door. Yum, real apples straight off the trees. I bought a heap of them. The cafe/restaurant is huge although quiet when we stopped by. The lovely lady who served us said that they often feed up to 500 in a separate area when busloads of Asians pass through. Whew, I'm glad we weren't there then, I could just imagine the din. These are available at Waitomo iSite and CaveWorld's change facility, I don't know about at the cave itself though. I didn't even think to ask and can't say that I saw any. Standing in one spot by CaveWorld I saw quite a few places to stay at Waitomo. 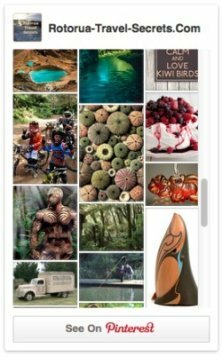 I'll just mention two that stood out, there's a very modern looking Kiwi Paka up a small hill behind CaveWorld and higher again is the Waitomo Caves Hotel. That one is a step back in time to the early 19th century and certainly looks the part of a grand old hotel. I loved this apt description on their website "sedate haven of faded décor, doubtful 60's renovations...," that so paints a picture doesn't it? Elise and Scott both thought it looked spooky and didn't like it one bit. She was seeing ghosts with axes hanging out the windows and all sorts. As you can see, my daughter has a great imagination. 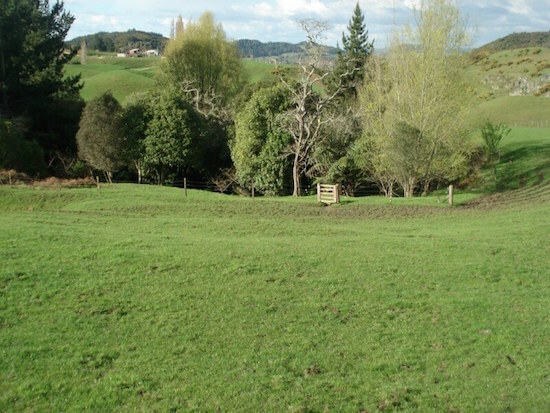 There's accommodation near Waitomo as well with B&B signs dotted along the roadside on the way in - that's coming in from the North.